Spurred by Iran and after careful consideration with Russia, Hezbollah has gone all in. The ‘Party of God’ has sent over at several thousand of its fighters across the border to take over much of the guerilla warfare from Assad’s forces. The Lebanese movement argues that their presence is necessary in order to protect local Shiite communities and shrines against attacks from Jabhat al-Nusra. And it does have a valid point, as it is not just the regime that is engaging in violence against civilians. But in practice, Lebanese (and Iraqi) Shiites are doing more than just protecting their communities; they are also fighting for the survival of Bashar and reinforce militant sectarianism throughout the region. Hassan Nasrallah is now blazing with confidence. In Lebanon, he has transformed the party into the most powerful political actor and de facto has total control over the current government. His main opponent, former Prime Minister Saad Hariri, is too afraid to even set foot in Lebanon out of fear of being assassinated. In Syria, Hezbollah’s fighters have ‘liberated’ the strategic town of Qusayr and are on route to take on the rebels in their stronghold Allepo. This confidence has resulted that Hezbollah can even kill peaceful protesters in Beirut and get away with it – evident from the scenes last Sunday in front of the Iranian embassy. Nasrallah’s self-confidence, however, could severely backfire. It has fuelled hatred of ‘the resistance’ across the Lebanese Sunni communities and created tension with their former allies Hamas, who are still influential in Lebanon’s twelve Palestinian refugee camps. In the camps, and in the predominantly Sunni city of Tripoli, protests against Hezbollah are becoming more frequent and it is not uncommon to see the famous yellow and green flag go up in flames. It has also drawn the attention of the Syrian rebels. Over the last couple of months rebels have frequently shelled the Baalbek area, Hezbollah’s stronghold in the North East of the country. 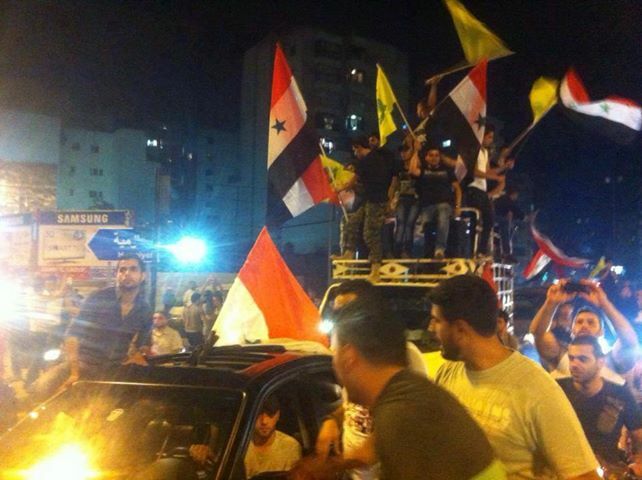 The question now is: will rebels also start crossing the border into Lebanon to fight Hezbollah on their own turf? This is not very likely yet, as the rebels cannot afford to divert resources away from their daily struggle inside Syria. They need all their men to halt the recent progress Bashar al-Assad has been making in Qusayr and Damascus. The rebels – and their Sunni supporters across the region – though have other tactics at hand to take revenge for Hezbollah’s shameless involvement in the Syrian conflict. Given the pattern of bomb attacks against Shiites in Iraq, it will likely be only a matter of time before Al Qaeda-linked militants will apply similar tactics in Southern Beirut and other Hezbollah strongholds – ‘the resistance’ is certainly expecting as much as checkpoints are already erupting in Southern Beirut. Last week, the influential Egyptian sheikh Yusuf al-Qaradawi called upon his follower to ‘wage Jihad’ against Assad and Hezbollah. As his programme on Al Jazeera attracts over 60 million viewers worldwide, his message will get heard. For these reasons, I expect Hezbollah – a designated terrorist entity by Washington DC and perhaps soon by Brussels too – to face terrorism in its own back yard during the course of this year. Like their brothers in Baghdad, Lebanese Shiites might also have to get used to car bombs and suicide attacks. Next Hezbollah: terrorists or facing terror?